Donja R. Love’s Fireflies, now at the Atlantic under the assured direction of Saheem Ali, is a play about the landscape of internalized trauma. Its language and design create a fearful panorama, a world where “the sky is on fire,” bombs resound in the not-so-distant distance, and hope is envisioned as “a long road covered in heartache” or as “the highest mountain,” on whose steep paths you might well meet death before you reach the summit. Set in the South in 1963 — just after the Birmingham church bombing that killed four black children — the play is the second in a trilogy meant to explore queer love at critical moments in black American history. (Its predecessor, the Civil War–era Sugar in Our Wounds, played at MTC last summer, and the triptych’s third play, In the Middle, takes place in the now of the Black Lives Matter movement.) The production is anchored by smart design and two excellent performances, and it’s a tricky one for me to reflect upon, springing, as it does, from a sensibility very far from my own. I’m not referring to the fact that I’m straight and white — though I know that I bring my own identity and experience to each piece of art I encounter, that not all art is made for me, and that part of my responsibility is to consider the effect of my engagement with a piece of work. I also know my own taste, and in the case of Fireflies, what I find myself outside is a kind of soaring purple tone, a style of storytelling that’s half soap-opera and half sermon. This is language as lush catharsis, language as endurance, language as empowerment, and it’s combined with a set of circumstances so earnestly dire that it often borders on the salacious. It feels like going to church — the kind of church where the minister thunders and rhapsodizes, aiming both to appall and exalt. It might well transport many, and the fact that it leaves me at the station doesn’t mean it’s not doing what it set out to do. I never did do well in church. Love takes every opportunity to weave new horrors into the plot, from rapes and murders to grisly hints at self-induced abortion. We should shudder at each new and awful twist, but as the hits keep on coming, they become weirdly cloying. Again, like a stereotypical Baptist preacher, Fireflies aims for an emotional forte early on and doesn’t often vary its pitch. 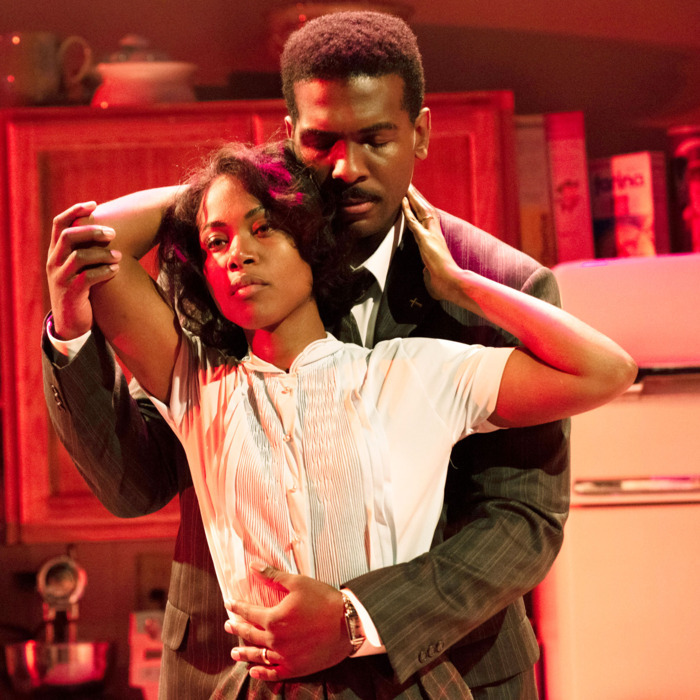 It’s a devilish target to aim for: Olivia is bone-weary from being “a colored woman … making something out of nothing everyday,” and no doubt Love means to convey the full weight of her struggle, but somehow the play’s lurid flights hinder our ability to feel honestly moved. It’s like a very rich meal, eventually dulling the very senses it seeks to sharpen and satisfy. The actors, and especially Wise, are what keep us invested. Davis skillfully finds the balance between Charles’s charisma and his weakness. Despite his many flaws — including the imbedded patriarchal presumptions of a man of his time — the Reverend Grace is playful and appealingly earthy. We can see what it is that drew Olivia to him, and that keeps her with him, despite everything. Theirs is a real love — perhaps not a love that should have led to marriage, but no less profound for that. And while Davis’s Charles is, in his messy mix of innocence and guilt, deeply human, Wise’s smoldering, taut-as-a-bowstring Olivia is almost part animal. It’s an electrically charged performance, the kind that you imagine an actor passing out after. Wise has extraordinary bright hazel eyes, cat-like in their intensity: They’re the eyes of a domestic creature that should have been wild, a creature that’s never at rest, whose small body contains a whole history of life before walls, before cages, before dependence. It’s the magnetic Wise who elevates Fireflies out of soap-opera territory. Her presence is so big that at one point — when Davis picked her up in a tender slow-dance, and she let herself lean into him, her tiny feet hovering above the floor — I was shocked at how slight she actually is. In a sense, Fireflies is her coming-out story, her journey from the brutal trap of her own mind, and her own home, back out into the world: a place no less brutal, but whose assaults she will face by having rediscovered her own soul. What makes Fireflies part of Love’s trilogy is that, despite her marriage and the baby she’s carrying, Olivia’s soul is queer. (She’s also a descendent of Henry, a character in Sugar in Our Wounds who, like Olivia, will ultimately bring forth offspring despite his true orientation.) Her bond with Charles is real, but she’s “never been able to feel the way [she] did” when, for a brief time, she was around the addressee of her many secret letters, the enigmatic Ruby. It may be either a feature or a bug that Fireflies’ story of queer love is a muted one, mostly subsumed inside the story of a fraught straight relationship — which already has plenty of reasons for its fraughtness outside of Olivia’s longings. Stories of the closet appeal to our sense of historical accuracy, and we’ve certainly seen plenty of narratives involving the gay husband in a straight marriage, but I’m not sure that that assumption of accuracy doesn’t sometimes limit our imaginations. Part of me wanted to see the play that comes after Fireflies, the play where Olivia tries to live as a queer single mother and radical female preacher in the 1970s. That’s a play I haven’t seen. And despite the fine performances that drive Fireflies forward, its tone and trajectory ultimately left me feeling like it was one that I had. Fireflies is at the Atlantic Theater Company through November 11.